Another weekend at Legoland with the Happy Meal meant another opportunity to sample a burger far from LA. We settled on the Denver-based franchise chain, Smashburger. There were three Smashburger locations in the San Diego area at the time of this review, and we chose the closest one--in Del Mar. We ordered a couple of basic burgers at the register and settled in. The beverage situation was the same as it was at Five Guys--get your own--two kinds of diet coke--nice. No free peanuts, though--I like free peanuts. The burgers were delivered about 5 minutes after we sat down, and they were nicely presented in paper-lined metal baskets--Smashburger was proud of what they had prepared and wanted to show it off....rightly so. The Beef: Angus, 80:20 Chuck. It had those good beefy flavors of funk from the aging and iron from the blood. It was deeply satisfying and flavorful. Sadly, it was a little too greasy for my tastes. They could have gone with a leaner blend--perfection: hard to come by. Even so, the youngster did the happy dance in his chair and made me promise to take my back in a couple of weeks. The Seasoning: A little too salty. The Sear: I asked that they sear mine as hard as possible, and it resulted in a pretty good but not a great sear. The Preparation: Medium/Fine grind, loosely packed, cooked to Well-Done with an OK sear from a hot griddle. Ordinarily, I would not be a fan of a Well-Done cheeseburger, but that was the only way to get a good sear on the thin patty. They seasoned the beef on the grill--it tasted like they hit it with salt only. The Cheese: American and perfectly melted over the patty while the burger was on the grill. The cheese was nicely salty and gooey, which melted into the crumbly beef to provide the needed kick of savoriness and lent some binder to make the mouth feel of the burger more firm--it balanced out the crumbliness of the Well-Done patty. The Bun: The basic bun, which we went with, was an egg bun. It was a perfectly neutral host for the meaty surprise that it barely contained. The bun was properly toasted, and it had just the right texture not to interfere with the feel of the beef. 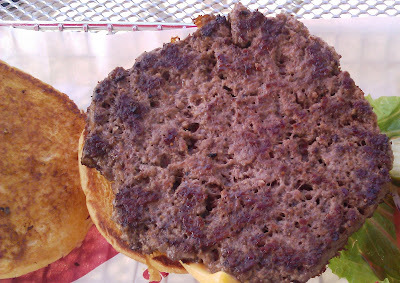 The Meat To Bun Ratio: In spite of the over-sized 1/2 pound patty, the bun held up perfectly. Next time, I will order the 1/3 pound patty--I really didn't need 1/2 pound of meat. The Fries: Meh. The Rosemary Fries---double Meh. The Value: The prices at SmashBurger are on the high end around 5 bucks for a basic, 1/3 pound cheeseburger. The value would have been fine had we skipped the mediocre fries. Quality control felt like a huge priority at Smashburger. I spoke with the manager, who was eating a burger at the table next to us while working on his paperwork. They had 10 employees working front and back of house--4 of them on the griddle. He shared with me that all of the ingredients were delivered from centralized Smashburger purveyors. Much like Starbucks--Smashburger would probably be the same everywhere. The buns came from a bakery in Illinois and were the same buns served at every Smashburger location. Smashburger could have done a better job educating its franchisees, since the cut of the beef was a mystery to the man in charge of the Del Mar location. The group that licensed the franchise rights in Orange County planned to open 17 more locations. SmashBurger was a high-end version of the awesomeness that is achieved at Steak 'n' Shake on the East Coast. The cooking process was similar, but the ingredients were of a much higher quality, and this resulted in a higher-end product. In 'N' Out, Smashburger is coming--they are coming for you, and they are better, faster, and better organized for rapid expansion. Note: We revisited Smashburger on 18SEP10. The youngest BurgerBuster (Happy Meal) sprinted to the door in anticipation of a repeat of the excellence he tasted on our previous visit. I ordered a chicken breast burger, since I really didn't want to die of cheeseburgers. However, this time I tried a bite of the youngster's 1/3 lb burger, and it was magnificent. The sear was completely out of hand--crisp, dark, thick, and salty. The greasiness that was noted in the 1/2 lb rendition was not present in the lightweight version. The sear comes and goes, though--there has been little consistency from visit to visit. Hey, if it helps. I work at a smashburger in Miami. We only sear the burger on the cheese side. The other side just gets cooked then slid on the bun. As for the seasoning, there is more than just salt, however towards the end of the batch, a lot of salt just drops to the bottom, you probably had the end of the seasoning shaker.